Lightweight comfort and protection combined in a low profile design. 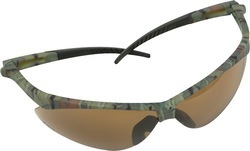 Bayonet-style wrap-around lenses with hinged arms. Rubberized temple ends provide maximum comfort and fit. Soft rubber nosepiece provides more comfort and reduces slippage. NOTE: 2 Color Max Imprint on Glasses. TruColor or 1 Screen Color Max on Microfiber pouch. Price: Includes One Standard Color on Lens of Glasses or TruColor on Microfiber pouch.